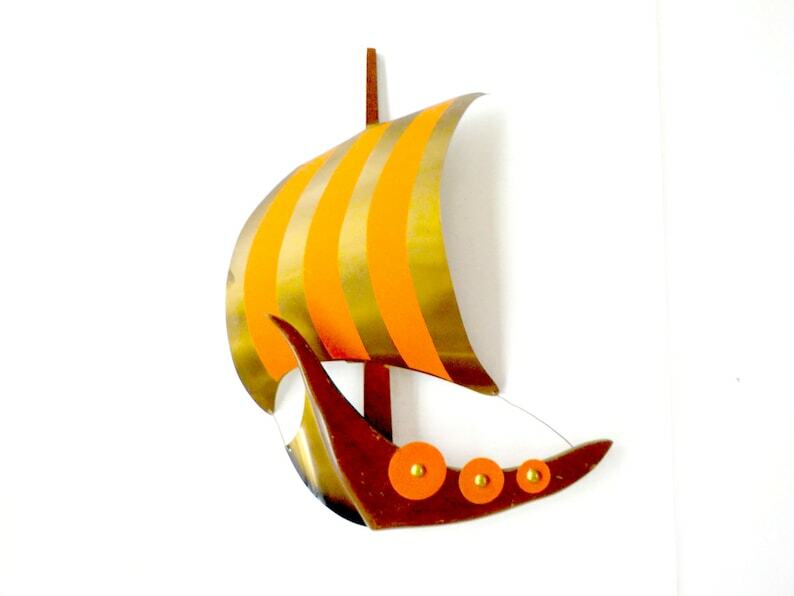 Very striking and colorful with a Gold and Orange Striped Main Sail, this Teak Viking Ship or Sailboat by Masketeers is perfect for a mid century Nautical Décor. This particular pattern of the stripes on the sail is difficult to find. The body of the sailboat or ship and the mast are made of teak, with the orange striped sail made of brass or metal. Nice and heavy, Masketeers possessed a reputation for high end home décor since their inception. In great vintage condition. The paint on the sail has a small area (about the size of a dime) that appears to be scratched and is visible in certain lighting conditions. This minor imperfection does not detract from the appeal of this mid century find. There are no dents, very little wear, some small scratches on the teak that is used for the body and mast of the boat. A quick swipe with Liquid Gold would do wonders on any imperfections in the teak, but that decision is up to the new owner. This is a very striking piece of mid century décor. I love vintage glass as they just don't make things the way they used to. These pieces are beautiful as they are hand-etched and heavy and just look really beautiful just sitting on the counter. Thank you. Fast shipping from a nice seller. Thanks! We accept returns for any reason within 14 days of receipt. If you simply change your mind, return your purchase in the same condition received and in the original packaging and your purchase price of the item will be refunded promptly when I receive the item back. The shipping expenses incurred are the buyer's responsibility, including those purchases that were shipped to you for free. If you feel the item pictures or description grossly misrepresents the item, seller will assume responsibility for all shipping, including return shipping. I provide detailed pictures and a thorough description, purchase with confidence. Shipping is completed within 1 to 3 business days from date of purchase. I am happy to combine shipping on multiple purchases if I can safely do so without risking breakage. Any shipping overages that are paid will be promptly refunded when shipped. My shop is located in Indiana. The USPS bases the shipping fee on the distance being shipped (based on postal zones) and the weight and dimensions of the package. The majority of my items utilize calculated shipping, meaning, the cost is based upon the above. Any overages paid on shipping will be promptly refunded when shipped, we do not make a profit on shipping fees. What if your purchase is a gift? If you are purchasing a treasure for a gift and would like to have it shipped directly to the recipient, no worries about receipts or invoices. I never put a paper copy in with my packaging. You will have a copy on your computer. Your gift recipient (if you choose to have it shipped directly to them) will not see any of the paperwork. For International Shipping - I ship internationally and strive for the most economical method of delivery. Please convo me with your Ship To address and I will give you the shipping charge amount prior to your purchase. Seller is not responsible for any VAT or Customs charges that may be imposed. Just a mention that items from my shop are vintage items, not new items. All have been previously owned and as with most vintage items, they are gently used and may show signs of use and wear. I try my best to give an accurate description. I will note in the item description any sign of wear that would affect the functionality or overall appeal of the item.